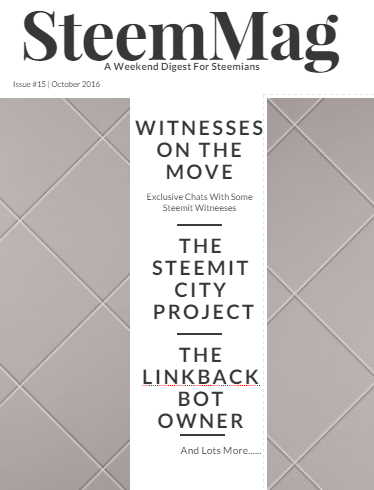 It is with great pleasure I welcome you guys to the fifteenth edition of SteemMag, a weekend digest for Steemians. This Weekend Edition has exciting features you would enjoy. Witnesses are essential components of the Steemit’s Ecosystem. Here’s a v.good explanation by @roadscape’s Steemd. On the Steem blockchain, witnesses serve a role of validating signatures and timestamping transactions by including them in blocks. A block is any group of transactions (posts, votes, transfers, etc) which update the state of the database. Each time a witness produces a block, they are paid for their service. If a witness fails to produce a block, then they are not paid, and may even be voted out. Every round of block production begins with the shuffling of 21 witnesses: the top 19 witnesses (by vote), plus one randomly-selected standby witness, and one miner witness. Each is given a turn to produce a single block at a fixed rate of one block every 3 seconds. If a witness does not produce a block in their time slot, then that time slot is skipped, and the next witness produces the next block. In previous issues, SteemMag has had the honor of interviewing quite a number of witnesses on various issues concerning the Steem Blockchain and Steemit Platform. Witnesses such as @steemed @smooth @nextgencrypto @complexring @riverhead @svk @anyx @phareism @roelandp@clayop @steve-walschot @thecryptodrive @good-karma @royaltifffany and @chitty have all been interviewed at one time or the other.. But recently, there has been a rise of new witnesseses’ campaigns.... So I thought it would be awesome to have a brief chat with a number of witnesses especially those who are not well-known but have been important in securing the Steem Blockchain in one form or the other. SteemMag had a chat with the team behind Steemit.city, an awesome initiative to create a Steem-backed co-working environment. I've also been giving out free SteemFest Tickets and this week, SteemMag announces the winners of our recent giveaway. You are one of the earliest Steemians … How did you join steemit? And how has the experience been so far? I joined steem at the early mining phase. Me being a blockchain and altcoins enthusiast, I’m looking from time to time in the forums and finding interesting coins. Steem looked very different from any other new coins, and caused me to want learning and participating in the mining. i wasn't familiar with the technology (Graphene) so it was a steep and interesting learning experience. Over the past few months, what has been your favorite moment and least favorite moment on Steemit? The most favorite moment was when authors started to get payments. When steemit went from alpha to beta phase. The Steem blockchain worked and performed very well, withstanding a lot of authors and a high transactions frequency. And it still amazes me it actually works. Authors are getting payment for popular posts, and curator's votes matter. Least favorite moment was when a hacker was stealing accounts access. The accounts were later returned to their original owner by using a hard fork. And the bug was fixed on steemit's website. What are some changes you would like to see on the Steemit platform? I would like to see added features over time, to attract more usage of the platform. Can't point to any specific feature I want at the moment. On the last version of steem, there is an escrow feature on the blockchain, which is not implemnted yet on steemit's website. As a witness, what are your plans to drive the growth of the platform? For good growth of the platform I did invite friends to join, but only friends who can bring high quality and authentic content. As a witness, I developed a few tools for witnesses to use. (price feed script, monitoring) and hoping to be able to add more. How has been your experience so far on Steemit? Actually I was one of the first to find Steemit ANN in bitcointalk in early April / May. But due to the last report for my PhD I was very busy at that time and didn't have chance to join the mining. When I finally had time to look at it again, the initial mining period was just ended LOL. Only after the first try, I was instantly hooked with Steem. The more I look at steem technology, the more I found its potential is impressive. It opens up many possibilities of the blockchain technology which we only could dream of before. You recently made a post about focusing on Steem fulltime. What was the most challenging aspect of making that decision? The most difficult thing is the paradigm shift. We used to think about our own security first, in this case, financial security. Old-school approach is to find a good job at a good organization and climb the corporate ladder. Maybe not all people were raised by this thinking, but at least that my parent taught me since I was very young age. Fortunately, with the new age of internet, the old way of think isn't true anymore. I have been offered a lot of opportunities to join a startup, but nothing was really impressed me by the way Steem did. With the birth of Steem and I was looking for an entire new journey, I decided that would be the right time for me to change my mindset. I did what my heart tells me and let's see how it will work out in the future. Why did you decide to run for a witness post? At first when I joined I still had my job so I thought running a witness and seed node with my own money for servers would be the first commitment of myself to the platform. I didn't get much votes from others at first, but slowly, I showed my progress and people know more about me and support me. Right now I'm at position 21. It has been an awesome experience and I would like to say thanks to everybody who supports me as witness. What are some things you look forward to seeing on the Steemit platform? I think Steem technology has potential to be more than just a blogging / social platform. Like Bitcoin is the first application of blockchain technology, SteemIt is the first application of Steem blockchain. I expect to see many other applications will be built in a near future. The #1 thing in the day of a witness is constantly checking #witness-blocks #witness and especially steemd/steemdb to make sure your witness isn't doing anything stupid. There's also the tightly knit community. If someone’s witness goes down, other witnesses will try to get in contact. For example, when @proctologic's witness died like a month ago, I went as far as contacting fyrstikken to figure out where the hell procto went. You joined Steemit quite early. How has the journey been so far? Not early enough to sign in as “Gandalf” (my favorite nickname had been taken two months earlier). I had no other choice but to use a different account name. So I chose gtg, as in Gandalf the Grey*. Just recently, thanks to the kindness of @masteryoda and @joseph, I was able to finally get the @gandalf ID on Steem. So far, it’s been very interesting. Steem is an interesting playground for infrastructure and security-related research. I’ve had a chance to meet and chat with many experts who have decided to participate in maintaining and developing this unique project. I try to remember how I joined Steem. I wrote a few words about myself in #introduceyourself category. I also currently moderate the channel #introduceyourself on steemit.chat, which is a place where newcomers can promote their introduction posts without being flooded by other random links. You initially intended being just a backup witness but you've found yourself in the top 19 several times. How has it been being a top witness? Yes, that has happened to me three times, once even for few days. There’s no real difference for me. Getting into the top 19 means that you have been approved by stakeholders with very significant amounts of shares. This is very gratifying and I am thankful for every vote. Technically, of course, when you get into the top19, your witness node starts producing blocks much more frequently, but any backup witness should be prepared for that. You could say that there’s a significant difference, namely rewards. That’s true, but only when you get them out of the Steem ecosystem. I continue to make my efforts regardless of my witness position. I have never powered down and I have never cashed out a single STEEM token. What has been the most exciting aspect of running for witnesses? In my person opinion, the most exciting aspect for running for a Steem witness is that there is no age limit to run a witnesses server! With that being said, it could really empower the youth to come on to Steem and run a Witness server! Surely, I am the youngest Steem Witness currently but I do hope some day a kid younger than me comes on here and runs a server! Your plans of increasing the Steemit community especially from the teen demography? As many know, I liaison with @SteemDrive and advertise Steemit on billboards all across the country - in particular, the billboard I liaisoned with was in my home town Chicago, IL. @SteemDrive is a great campaign to advertise Steemit being that it gives "real world" validity, but, Ricardo and I have more plans in the future that I am almost positive will grasp kids and adults of all ages to come on to this wonderful platform, Steemit! LOVED this article as I have personally interacted with both @gtg and @theprophet0 and they are really honorable guys who contribute a LOT to this community. It just goes to show @infovore how much YOU contribute as you realize this and give them some exposure while also sharing valuable info with the community. I would like to say that @theprophet has so much potential and I am so excited to see him so consciously involved at such a young age. Education and parenting are one of my biggest passions as I feel the whole system is totally rigged to indoctrinate children to be complacent tax paying citizens. Yet The Prophet is showing a new example that is actually ACCESSIBLE to youngsters DESPITE the system! You should create a whole web site, FB page and other things to inspire other teenagers to the great potential! And you're right. Its so gladdening seeing someone as young as @theprophet0 making substantial progress.. It makes steemit such a wonderful place to be. Thank you for that acknowledgment as I truly dedicate a lot of time and love to this community. I have been dedicated to building a whole new world for 15 years already and have given up everything to realize it. When I see something like Steemit with this truly revolutionary potential I am inspired to support it as best as I can, in hopes to see it flourish. Just as I would hope others would invest in supporting and contributing to the TRULY revolutionary purpose I have been achieving for a decade. When I see someone like @ptheprophet0 I am also inspired to support as there is great potential there. I want to nourish that when I see it so as it may flourish to the benefit of us ALL. I see that in you also and that is why I make sure to tune in to your posts and support with my UPvotes and comments. Thanks @macksby for dropping by again.. I'm glad you enjoyed the interviews.